New projects announced from Matthew Rosenberg and Tyler Boss, Rob Guillory, J.H. Williams and Haden Blackman, Sam Humphries and Jen Bartel, Annie Wu and more. As they’ve done in previous years, Image Comics dropped a metric ton of announcements at their Image Expo event, held today in Portland, Oregon. The line-up of announcements this year includes five new titles from Todd McFarlane’s camp, new titles from Chew creators John Layman and Rob Guillory, two comics from Christoper Sebela, the fact that they’ll publish the Netflix/Millarworld titles starting with The Magic Order and much more. No doubt there are interviews aplenty dropping around the internet on all these new projects, so I’ll start with the text of the press release, then add art and commentary as I find it. 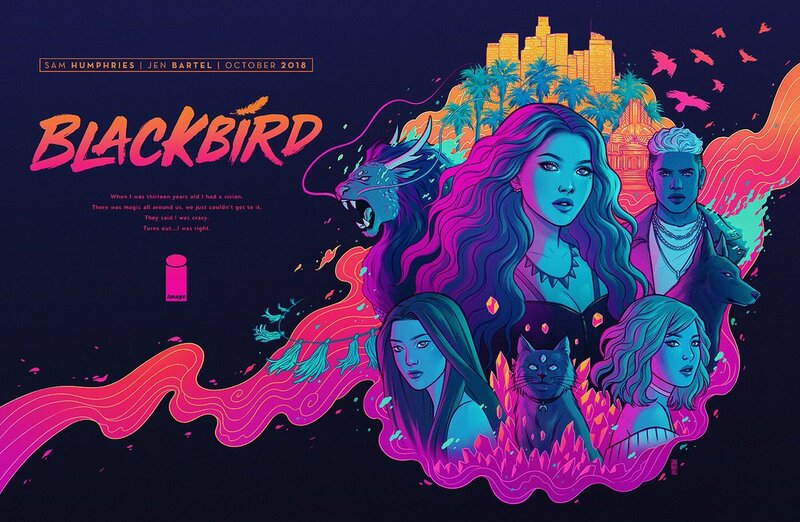 Sam Humphries and Jen Bartel team up to co-create Blackbird, a modern fantasy story best described as Harry Potter meets Riverdale. It follows a young woman named Nina who discovers a neon-lit world of magic masters in Los Angeles. Now they’ve kidnapped her sister, and Nina is the only one who can save her.